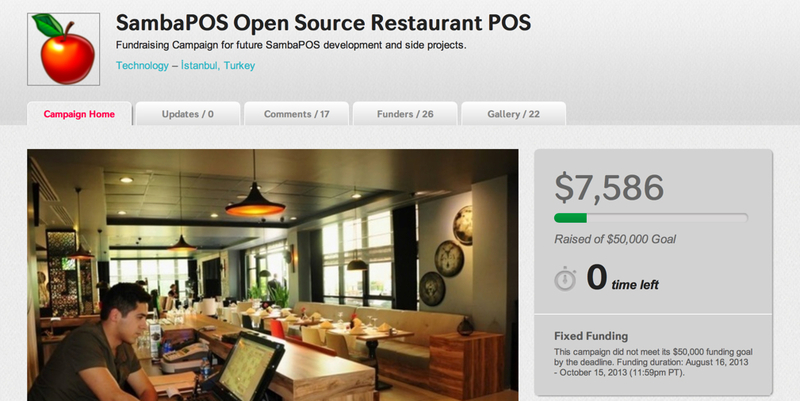 First of all I want to thank to especially John, Ozer and everyone else who supported SambaPOS project to reach it's goal. Also I want to thank to everyone who helped us by supporting our community and also I want to thank to everyone who interested on SambaPOS project. In fact that contribution is a serious amount for an open source project. I'm really proud of that. We have a small group of supporters who trusts SambaPOS and wants us to continue. Thank you for everyhing you did for SambaPOS. On the other hand with that campaign we aimed to create a dedicated team but it seems that won't happen soon. So our problem still exists and we need an urgent solution. You need more features, more documentation, more support and we should fulfill these requests. Open source business model is all about building a community. Community is important because unlike traditional business models you don't create limits to force people to pay. Open source is freedom and "Freedom" means that. You remove limits for the community and community supports that. While starting SambaPOS we thought we should choose that model. But before thinking that we forgot to ask another important question. Does restaurant owners needs such freedom? Anyone really cares that? Maybe yes, maybe no or maybe we did it wrong, or something else. The short summary is SambaPOS built, installed on thousands of restaurants, translated to 18 languages, released and supported for free for 3 years with the expectation of building a community support and we failed. This is the reality we're facing now. We built everything on trust. We never lied or tricked anyone. I always said what I'm really thinking as my language permits. I'm still thinking open source model is the best choice and we should continue that. However I've lost my belief about I'll be able to build a supportive community and this situation forces me to prefer one of other commercial business models instead. On the next week I'll consider my options and give the final decision about the future of the project. I'll be happy if you help me with your thoughts and suggestions. I was very sad because I am not able to achieve the goal , I swear I tried I could not help more . The reason for not getting help was the fact that the same financial , needed to make sales to raise funds . But could not a view that I had to adapt a few things for my country , so it will be remarked that the term and updates not influenced to some other people too? For example whenever you leave an update in my case , I had to update the databases . Does a new opportunity for us to prepare ourselves to better contribute not solve ? I do not know if they are to understand very well what I mean , but sambapos was and is something that changed my life , so I think other people felt the same and so my sadness of not getting help. I made every effort possible . I was super excited for 2014 with all the news that they would be released and now wonder if they will be going to trade these updates could not be marketed ? How many people or companies would be required to be able to generate enough money to go slowly releasing ? Would that we could somehow contribute monthly ? I do not know if I could explain well what I mean , but please Emreeren we think of a second chance , for example give us a longer period without releasing updates to captarmos money , I think the last update ( v28 ) and perfect for captarmos funds and open sambapos as commercial . I was disappointed that the campaign failed, but you still need to raise funds! The way I see it you need to sell added functions on top of Samba POS. These will be sold at a reasonable rate while the product is still in development. The most requested first, maybe Android client, hotel booking feature, Kitchen/bar orders monitor etc. With better documentation, web support and a stable base package many hotels/restaurants would ditch there present systems and buy the add-ons to Samba POS. You also possibly could sell via the internet preconfigured software systems packages, customers filling out hardware list/business requirements. Very soon you would have almost all configurations on the shelf. Support packages could be another option? Just found out about your software, rather accidently, while looking at other, better known open source pos systems (bravo, unicenta, and floreant). So part of your problems is you aren't well known enough. I still have no idea how good & solid your solution is. I'm willing to pay for a solution - with all the periperals specified and faith that the pos will be solid on a solid database and ... ideally... that there will be an inventory module available. What language is sambapos written in, btw, because the downloads all say they are exe files...which implies windows only? I have a mac, btw, and would like to try your system out to compare it to floreant (unicenta appears too general a solution .. too complicated when I only want a specialized bar/restaurant solution.